At Westview Animal Clinic we strive to provide the best integrated care available for your pet. We understand the importance and impact our pets have on our lives. The well being of your pet is our priority. 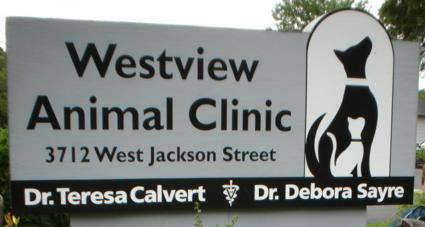 Westview Animal Clinic opened its doors in 1952 by Dr. Richard Goodale. The practice thrived over the years. Dr. Teresa Calvert had been working for the clinic along with Dr. Perrel for four years before purchasing the practice in 2003, when Dr. Perrel retired. Dr. Calvert continues providing the same level of excellence the clients had come to expect over the years. To ensure your pet receives the best possible treatment, the members of Westview Animal Clinic continue their educations on the most current veterinary care and procedures. The Veterinarians also have become educated and certified in offering alternative healing techniques, providing an integrative approach in caring for your pet. We primarily see small animals with a few exotic animals seen by appointment only.